Scientists have developed a new technique for investigating the effects of gene deletion at later stages in the life cycle of a parasite that causes malaria in rodents, according to a new study in PLOS Pathogens. The novel approach, developed by Upeksha Rathnapala and colleagues at the University of Melbourne, Australia, could enhance research into potential drug targets for malaria treatment. New treatments are needed for malaria because of increasing drug resistance in the single-celled Plasmodium parasites that cause it. Metabolic processes in that are essential for its development could serve as potential new drug targets. However, the Plasmodium life cycle, which occurs in both mosquitos and host animals, makes it difficult to identify and study such processes. In the new study, the researchers demonstrate their novel technique by focusing on an important metabolic process in Plasmodium berghei, which causes malaria in rodents and is commonly used in mouse studies of malaria. This metabolic process requires a gene known as the ferrochelatase (FC) gene, and it allows P. berghei to produce a chemical compound known as heme. Heme synthesis is known to be essential for P. berghei development in mosquitos that transmit the parasite between rodent hosts, but it is not essential during a later stage in the host bloodstream. However, between these two stages, P. berghei undergoes a developmental phase in the host liver, and it has been unclear whether heme synthesis is essential at this stage. Rathnapala and colleagues produced P. berghei parasites that are capable of expressing the FC gene and developing properly in mosquitos, but produce a mix of FC-expressing and FC-deficient parasites once they infect mouse liver cells. The scientists genetically engineered the parasites so that FC-deficient individuals would express fluorescent markers, allowing for easy identification. The researchers found that FC-deficient parasites were unable to complete their liver development phase. This suggests that disrupting the heme synthesis pathway could be an effective way to target Plasmodium parasites in the liver. Such an approach would be prophylactic, since symptoms aren’t apparent until the parasite leaves the liver and begins its bloodstream phase. 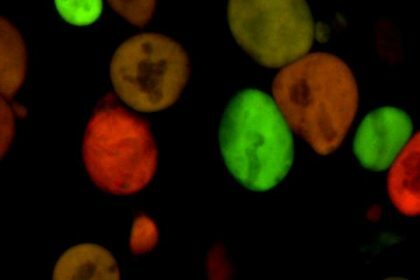 This same novel approach involving fluorescent markers could be adapted for other genes, allowing scientists to identify additional metabolic processes that are essential for Plasmodium development in host animals.